You are reading this page probably because your dog has unfortunately been diagnosed with some form of canine cancer. Don't despair and don't give up hope. I know it is hard but all is not lost yet. There are a lot of things that you can do to help your dog through this difficult time. The first thing that many holistic veterinarians tell dog parents to do when their dogs have been diagnosed with cancer is that, they should stop feeding their dogs commercial kibble. Kibble is cooked under high heat. This results in the production of various carcinogens (such as acrylamide). Many cheaper brands of kibbles are full of fillers, artificial preservatives and flavors, which of course are not good for dogs (and humans). Cheaper brands of kibbles are high in simple, high glycemic carbohydrates (e.g. corn, wheat, white rice). High glycemic carbs promote obesity, which is closely linked to cancer. Kibbles are also high in gluten (e.g. wheat-based kibbles), which causes inflammation. As we know, inflammation is associated with a lot of chronic diseases, including cancer. A 2009 study by the Environmental Working Group (EWG) found that 8 out of 10 brands of kibbles contained fluoride levels that were 2.5 times higher than the EPA's maximum dose allowed in drinking water. Most of these problematic kibbles had "meal" (e.g. chicken meal, beef meal, bone meal) as one of their main ingredients. If a dog ingests too much fluoride, the excessive fluoride gets stored in the bones and can cause canine osteosarcoma (bone cancer) down the road. It is therefore not difficult to see, if your dog has cancer, you definitely NOT want to feed him a diet such as kibbles that can cause more health problems! From a holistic point of view, many forms of dog cancer are caused by a weakened immune system, which in turn is caused, amongst other things, by a poor diet. 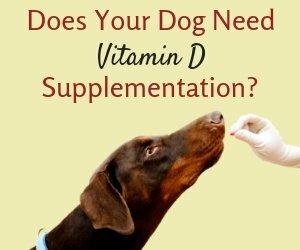 So it is important that a dog with cancer should have a natural and nutritious diet, enriched by appropriate natural supplements and vitamins. Instead of kibbles, holistic vets recommend a natural, organic home-cooked or raw diet. There are also suggestions that dogs with cancer be fed a special dog cancer diet, namely, a low-carbohydrate, high-fat, high-protein diet. In an article entitled "Nutritional Approaches to Cancer Therapy", Dr. Ogilvie (DVM at Colorado State University) states that most cancer cells rely on simple carbohydrates (sugars) and, to some extent, proteins, as energy sources to grow and reproduce. Cancer cells do not do so well on specific types of fats. Unsaturated fats, especially high quantity of Omega-3 fatty acids (e.g. fish oil, flaxseed oil), should be given to dogs with cancer. Other studies have also indicated that Omega-3 fatty acids can make tumor cells more susceptible to chemotherapy and to the dog patient's own immune system. What's more, there is evidence that Omega-3 FAs may help prevent the recurrence of cancer after remission. On the other hand, Dr. Ogilvie warns that Omega-6 fatty acids (e.g. borage oil, primrose oil) have been proven to accelerate cancer growth, so Omega-6 should be limited or avoided. A higher amount of proteins and amino acids should be included in a dog cancer diet. The proteins must be of high-quality (human-grade) and easily digestible. In addition, two amino acids that should be present the diet are arginine (an immune system booster) and glutamine (which supports and maintains the health of the GI tract). If you want to include carbohydrates in your dog's cancer diet, use only very small amounts of complex carbs such as oat, brown rice, barley, etc. Simple carbs (sugars) should be kept to a minimum. Note, however, that it doesn't mean you should not give veggies or fruits to your dog at all. Some veggies (e.g. broccoli, carrots, brussel sprouts) contain a lot of vitamins and minerals and are beneficial to dogs. 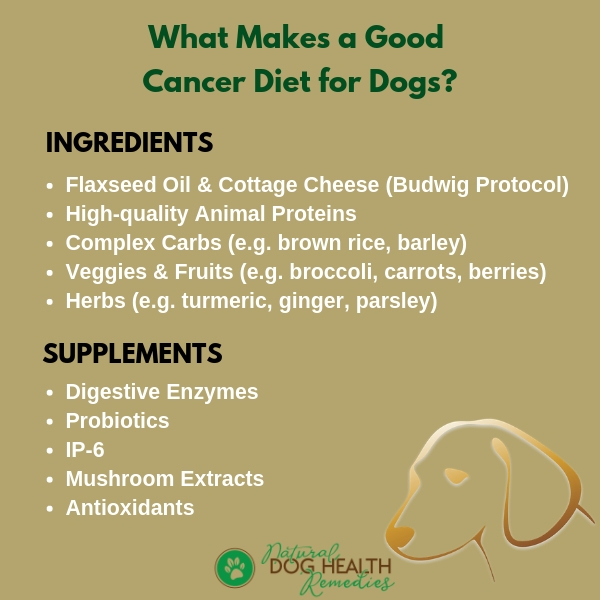 As a general guideline, a dog cancer diet that contains 50% to 60% of total calories from fat, 30% to 50% of calories from protein, and the remaining portion of calories from soluble carbohyrates is recommended for dogs with cancer. Cancer cells metabolize glucose for energy via a different pathway to healthy cells. Most cancer cells cannot utilize fatty acids or ketones (ketones are produced using fat in the liver when glucose level is low in the body. ), and depend on glucose availability. 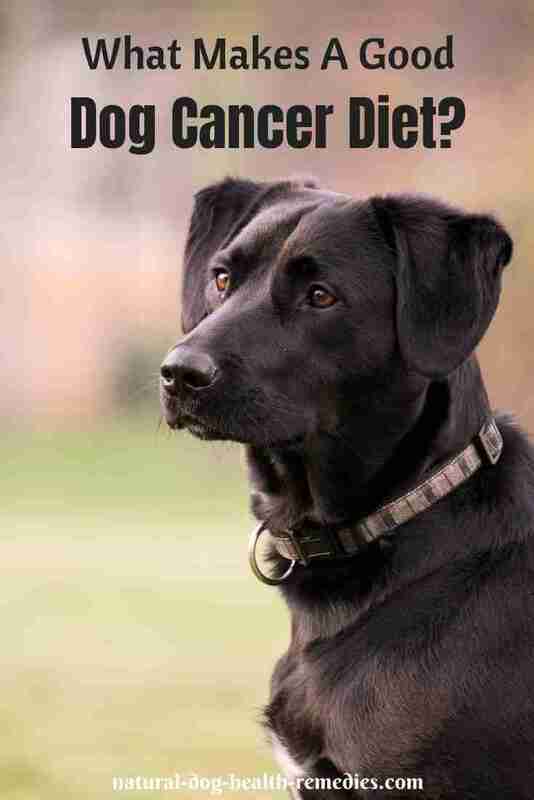 Therefore, a diet high in fat (ketogenic diet) and low in carbohydrates is beneficial for dogs with cancer. Ever heard of the "Budwig Protocol" or "Budwig Diet"? It is a simple diet of cottage cheese and flaxseed oil suggested by Dr. Johanna Budwig (a German research scientist). In her life-long research on fats and proteins and how they affect our health, Dr. Budwig found that when organic flaxseed oil are combined with organic cottage cheese, which is rich in sulfur protein, the chemical reaction produced makes the oil water-soluble, making it easy to be absorbed into the cell membrane. Thus, mixing cottage cheese with flaxseed oil supplies your body with an abundant supply of lipoproteins. Dr. Budwig claimed when cancer patients followed this diet for around 3 months, the size of their cancer tumors would gradually reduce. There are also anecdotal stories about how dog parents have successfully treated their dogs with cancer by using this diet. Since flaxseed oil and cottage cheese are healthy foods, it seems there is no harm in trying. A word of caution: some dogs are prone to develop pancreatitis when fed excessive amount of fats, so watch your dog carefully if you do decide to try this diet. You may want to use some herbs (e.g. dandelion or burdock) to help his pancreas. Add one tablespoon of organic flaxseed oil to half a cup of organic cottage cheese. Using a mixer or blender, blend the two ingredients well. You can feed it to your dog three times a day for at least 3 months. For old dogs, it is better to substitute cottage cheese with plain yogurt since old dogs may not be able to digest the lactose in cottage cheese. The rest of the cancer diet should avoid flaxseed oil and cottage cheese (or yogurt), since your dog will be getting sufficient amounts of such food items in the Budwig diet. For the rest of the diet, you should include high-quality proteins and amino acids (e.g. organic chicken, sardines, turkey, pork, lamb, beef). Also add beneficial veggies and herbs (e.g. shiitake mushrooms, cauliflower, cabbage, red and yellow bell peppers, broccoli, carrots, brussel sprouts, turmeric, parsley, ginger, fresh berries, etc.) You may also include some complex carbs like brown rice, barley, etc. A dog with cancer will understandably lose his appetite, resulting in malnutrition. One simple way to stimulate his appetite is to warm his food up to around 100°F (about 38°C) to release the aromas in the food. Another way is to add a little bit of sea salt to the food. You may also want to add tasty and nutritious "toppings" to your dog's food to entice him to eat more. One way is to add some bone broth such as Only Natural Pet Grass Fed Beef Bone Broth to the dog's food. It's not only tasty, but adds a lot of nutrients to the diet. Did you know that herbs can also help dogs with cancer? Visit this page to find out more! Even an all-natural, nutritious dog cancer diet cannot help your dog if she cannot digest the foods properly. Digestive enzymes aid digestion and absorption of foods, enabling your dog to get all the nutrients from the foods to help fight cancer. It has also been found that enzymes provide the potential for less cancer metastasis and recurrence, as well as longer survival times. Additionally, enzymes can reduce side effects from radiation and chemotherapy. Digestive enzymes should therefore be added as a supplement to a dog cancer diet. Note, however, that enzymes have blood thinning effects and should not be given to dogs with clotting disorders. Also stop giving enzymes to dogs 10 days before surgery and do not resume until the sutures are removed. Probiotics are important in supporting and strengthening a dog's immune system. The digestive system is the largest immune organ in dogs. 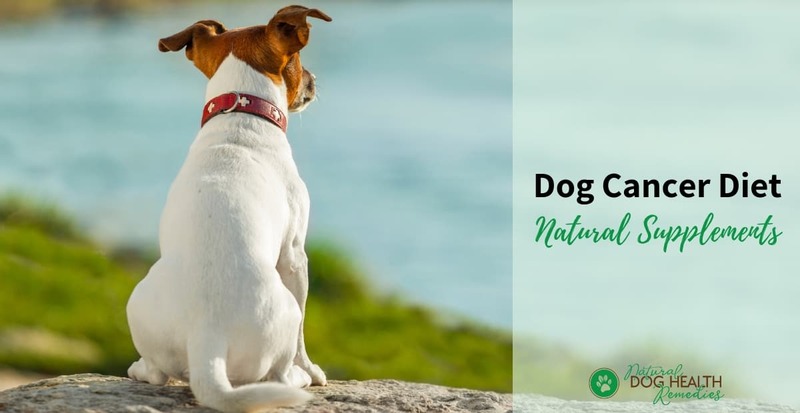 However, very often, dogs on medications (such as antibiotics, corticosteroids), under stress, or after surgery are depleted of the "friendly" bacteria that live in the dog's gut. As a result, the good-to-bad bacteria ratio in the dog's gut is upset, greatly weakening the dog's immune system. To strengthen the already weakened immune system of a dog with cancer, therefore, a high quality probiotic supplement is essential. You can easily get a digestive enzyme and probiotic blend such as Pet Wellness Blends Pet Probiotic and Digestive Enzyme Blend (Affiliate link). IP-6 is an extract from the bran of brown rice. Studies have found that IP-6 can help control the spread of tumors by boosting the immune system and increasing the body's natural killer cells. In addition, IP-6 may also be used to prevent cancer since it also possesses antioxidant properties. Here is a good product of IP-6: Integrative Therapeutics Cellular Forte (Affiliate link). Mushrooms (e.g. shiitake, maitake, reishi) have different active components that have strong immune support and anticancer properties. For example, polysaccharopeptides (PSP) and protein-bound polysaccharides (PSK), extracts from mushrooms, have the ability to inhibit cell proliferation in cases of leukemia, lymphoma, breast, lung and prostate cancer. They also support the immune system by enhancing T-cell growth. Check out this mushroom supplement: Only Natural Pet ShroomImmune (Affiliate link). This supplement contains whole foods such as berries, green tea, as well as herbs (e.g. milk thistle, turmeric), all of which are powerful antioxidants that fight free radicals. This supplement contains powerful antioxidants such as green tea and alfalfa powder, vitamin E, coenzyme Q10, selenium, and more. Next: Learn more about different cancer treatment options for dogs.